Mayview Missouri; 1939. From Fiegenbaum-Gerber family; all rights reserved. Front Row, from left to right: Wilber Neher; Raymond Fieth; Rev. Alvin C. Kniker; Earl Daniel Edwin Struchtemeyer; Louis Henry Tempel (better known as just plain L H). Back Row, left to right: J. W. Fiegenbaum; Norman Maun Tempel; Loyd Rabius; Julius Rechtermann. In 2002 when I spoke with J. W. Fiegenbaum about this photograph, he recalled that the class was confirmed on the Sunday before Easter. It was a very wet day. Most of the roads in the area were unpaved and were a morass of mud. The Fiegenbaums, living on the farm on Douthit Road, hitched their John Deere Model D tractor (formerly owned by Edwin Fiegenbaum) to the 1935 Studebaker Commander and towed the car up to the highway. They may well have left the tractor there until after church. J said the roads were in such bad shape that it is very possible that the family was late enough getting to church that they missed Sunday School (which always preceded the church service and included both adults and children), but not the service itself and confirmation. 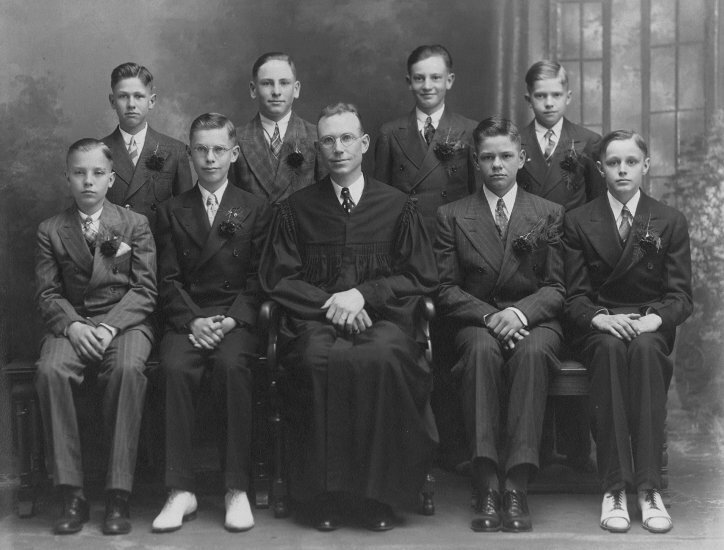 It is not known whether this professional portrait of the confirmation class was taken at a local photography studio, or if the special backdrop and camera equipment were brought to the church.